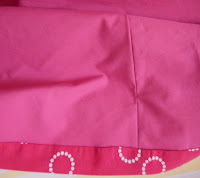 This is the dress for which I cut out a skirt lining from a pink sheet, which was the instigator of my recent reversible Simplicity dress. I added underlining because this dotted fabric, while cute, was also quite see-through if I was standing in any kind of light. I love the underlining -- it makes the skirt stand out crisply and hold its shape. It also makes it less likely to blow up scandalously in a strong wind, as I discovered to my relief when I wore it this week! nice and straight-hanging from the outside. This dress fabric is a recycled sheet I found at the Goodwill recently, I think it's another IKEA branded one. Good quality cotton -- it has a light, crisp hand, and is quite solid, in the sense that I had to be careful with pins -- it resisted any slightly dull pins and didn't want to recover from any pin or stitching holes. That quality gives it a nice polished appearance though. I like the pockets, the collar, the shape of the bodice, the pleats -- I like all of this one. The only changes I made were small fitting ones, like shortening the bodice by 1/2", although I do wish now I'd have shortened the back bodice by another 1/2". It does feel like it sags a little in the back waist, sadly. Not enough to stop me from wearing it, but I know it could be better. I also lengthened the sleeves -- mostly so that I could cut them on the preexisting deep hem of the sheet and have halfway self-lined sleeves with no extra effort. I also ended up taking off the button loop at the front and just leaving this open as a V (which I had shortened by 1/2 " so it wasn't so deep). When I had a button on and had it closed up, it looked just too frumpy on me -- funny how one tiny thing like that can change the look completely. my perfectly matched earrings here too! This is the first Lisette pattern I've used, and I really like it. I thought that the collar might be a little too much, but as it turns out I love it, and it was the element that most people commented on when I first wore it. The pattern was very easy to follow, with well written instructions and techniques that are simple enough even for a beginner sewist who is looking for a bit more of a challenge than a 'very easy' dress. The pattern also includes a little jacket that looks like it could be interesting too -- perhaps I'll try it eventually. I enjoyed wearing this very bright dress on a rather blustery day. It brightened my mood as well as my wardrobe! and the circles are lined up on the angle on the collar too...nicely done! Sometimes luck in on my side ;) And thankfully the pattern was not crookedly printed on the fabric - which confounds any matching at all. Ohh, they do look like buffering circles too :) - very clever of you to see this. A lovely dress - and what a great find in the cotton sheet - economical and looks fantastic. Cotton is cotton, as far as I am concerned. I think the bodice looks alright where it is. Thanks Linda - it makes me smile, both the colour and the link to our online life too! This is just adorable! You've convinced me to go to Goodwill and check out their sheets! Enjoy your lovely dress. Definitely check your thrift stores out -- I always unfold all sheets etc. to make sure the centres aren't faded and that there are no flaws before I buy. But you can find some neat stuff! This is so sweet and I can see it styled a lot of ways! Thanks! I agree, there could be a few ways to wear it. It is also surprisingly comfortable as well! I like the retro look of this dress - good fabric choice for this style. Great job on construction too. Thank you Rachel! I do like this style in such a fun print. Great dress! I've been thinking of trying out this pattern since I've had good luck with the Lisette line. I like the collar, too. It is cute in the same fabric as the dress. I also like the skirt shape! And pockets...yay! Always pockets for the win ;) I do like this silhouette a lot.